Ceramics at their most basic is simply a process of mixing water with earthen powders and clay, shaping it and baking it at high temperatures. But it is one of the world’s oldest crafts, which over millennia has been perfected to a high art, particularly by the Chinese, whose porcelain has had an enormous influence on other cultural traditions around the world; it is no coincidence that the English word ‘china’ is named after the country. Until recently, it was believed that the emergence of agriculture in the Neolithic period had led to the creation of fired clay vessels for cooking and storing food, but a 2012 study using radiocarbon dating confirmed that the shreds of Chinese pottery discovered in Xianrendong Cave in China’s Jiangxi Province dated to 18,000 BC, the height of the Ice Age. The key factor in the development of Chinese pottery was kiln technology. The two main types of kilns (the tall, thin dragon kiln and the horse-shoe shaped mantou kiln) that were developed in about 200 AD remained in use until modern times. The manufacturing of porcelain was perfected in the Tang dynasty (618–907), with precise techniques to control the casting process and development of diverse glazes producing delicate pieces that raised the craft to high art. During the Yuan dynasty (1271–1368), Jingdezhen became the pre-eminent centre for producing porcelain in a variety of styles and in the Ming dynasty (1368–1644), in addition to supplying porcelain for domestic use, the city became the main production centre for large-scale porcelain exports via the Silk Road. At that time, the Emperor owned most of the workshops and the most important kilns were often reserved for royal use. Large quantities of ceramics were made exclusively for foreign trade or as diplomatic gifts, initially to East Asia and the Islamic world. Portuguese traders began importing late Ming dynasty (1368–1644) blue and white porcelain to Europe in the beginning of the 16th century. During this time, two Portuguese merchant ships were captured by the Dutch and an extensive amount of porcelain from China from the cargos was sold off in the black market, igniting a craze for porcelain in Europe among royalty and the wealthy, especially in Germany and England. The Dutch East India Company (VOC) was the most successful European company trading with the Far East at that time and established firm links with China. Millions of pieces of Chinese porcelain were imported in the early 17th century – the Dutch Golden Age – when only the richest could afford the highly prized workmanship. Following the death of the Wanli Emperor in 1620, the supply of porcelain exports to Europe was interrupted, and Dutch potters saw an opportunity to produce a cheap alternative. They started to imitate Chinese porcelain, which became the tradition of Delftware. Today, the Rijksmuseum (Dutch National Museum) owns a magnificent but relatively unknown collection of Chinese porcelain and ceramic ware that was exported to the Netherlands during the Ming and Qing dynasties. Early this year in the Hague, Gemeentemuseum held an exhibition, ‘China Character – The Story On Porcelain’, taking a fresh look at the inspirations drawn from Chinese culture, and looking into its history, symbolism and cultural implications. Works from more than 15 Dutch museums and private collections, from the 16th century to today, including commissioned pieces created by Dutch designer Hella Jongerius, Hans van Koolwijk, Jelle Mastenbroek, Cristiana Vignatelli and Marcel Wanders, are showcased. Delft University of Technology graduate David Derksen’s exhibit, ‘Oscillation Plates’ (2013) was one of the finest examples, combining the ancient Chinese craft with contemporary experimental gestures. The patterns on the plates represent the mathematical rules in play when the pendulum is swinging together with the random incidence of the human who causes it to move.This echoes perfectly the Chinese concept tiandi ren (harmony between and unity of man and universe). At Dutch Design Week in October Derksen presented another collection he created during a recent residency programme in Jingdezhen. The Imperfect series creates beauty from deliberate faults such as melting pieces together or making them otherwise deformed. Fellow Dutch designers Judith van den Boom and Sharon Geschiere also visited China for its excellence in techniques and facilities. Their ‘Knotted’ vases with their rough sandy textured glazed surface includes a flowing form, which represents the moment of a brainstorm. Model master Franz Anton Bustelli, created the Chinoiserie collection in 1757 for German company Porzellan Manufaktur Nymphenburg. Chinese porcelain was deemed as ‘white gold’ in Germany and was a highly desirable commodity among the aristocracy during the Baroque period (1600 to 1750). Its fragility chimed both with the aesthetic of the time and the desire for levity. Since the 18th century, Porzellan Manufaktur Nymphenburg has been one of the most successful potteries mimicking the Eastern treasure, and has been handcrafting fine porcelain and developed its own porcelain culture for the past 260 years. One of the most renowned model masters in history, Franz Anton Bustelli, created the Chinoiserie collection in 1757 for the company, reflecting prevailing Chinese influences. The collection is a table piece of exquisite Chinese figurines in the prevailing style. Alongside the Commedia dell’Arte series, Bustelli graced the history of global porcelain art with his fine creations. The British and the Chinese share a passion not only for porcelain but also for tea. 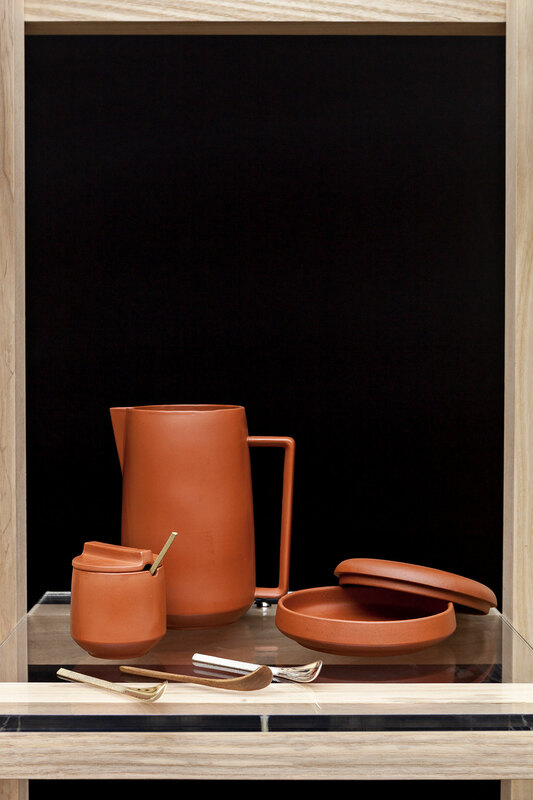 This year at the Salone del Mobile in Milan, British designer Christopher Jenner revealed his contemporary ceramic tableware collection in collaboration with Yixing Ceramics with an installation titled The Tea House, using the purple Zisha clay from Yixing in Eastern China’s Jiangsu Province that he discovered on a recent trip to China. Today, there are 11 key innovation and manufacturing hubs in China – Jingdezhen in Jiangxi province, Yixing in Jiangsu, Chaozhou in Guangdong, Liling in Hunan, Tangshan in Hebei, Dehua in Fujian, Zibo in Shandong, Foshan in Guangdong, Yuzhou in Henan, Longquan in Zhejiang and Yongchun in Fujian – and together they are responsible for two thirds of the world’s ceramic production. To celebrate China’s porcelain history, and to call for its revitalisation both at home and abroad, Jingdezhen has commissioned Beijing-based architecture practice Studio Pei Zhu for the design of Jingdezhen Imperial Kiln Museum. The site sits adjacent to the Ming and Qing imperial kiln ruins and surrounded by many ancient kilns varied in size; the building is designed as an abstract representation of the traditional kiln. The museum is due to open next year.